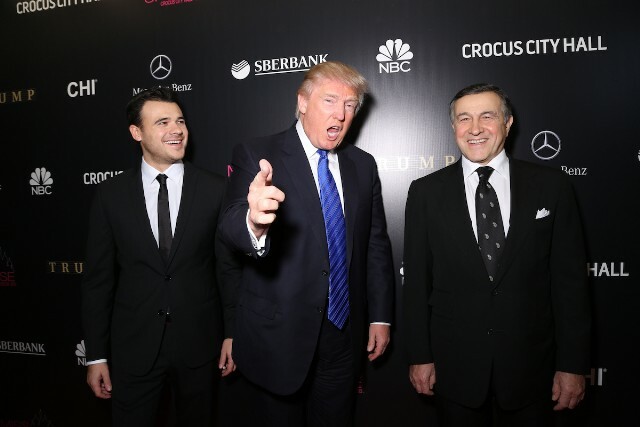 Donald Trump pictured with Emin Agalarov, left, and Aras Agalarov, right. A key missing piece of information that the Times did not uncover was who exactly brokered the meeting between the Trump clan and the Russian lawyer. That question was answered in another follow-up, this one from the Washington Post, which reported yesterday that the summit was arranged by a man named Rob Goldstone. Goldstone has spent his career doing music PR, as Billboard reports, first for artists like Michael Jackson and James Taylor in Australia, and then later for relics of a more innocent age like Hard Rock Cafe and Virgin Megastores. The way in which Goldstone got entangled in potential geopolitical subterfuge is by representing an aspiring Russian pop singer named Emin Agalarov, whose father is a billionaire named Aras Agalarov. Like other obscenely wealthy Russians, Agalarov has done business with the Trump family—in this case, both the elder and younger Agalarov were instrumental in bringing the 2013 Miss Universe pageant to Moscow. You can see the three grinning together on Aras’ Instagram. As Buzzfeed points out, Goldstone made his connections to Russia, and his affinity for Trump, very clear on social media. On the day of the meeting in question, Goldstone checked into the Trump Tower on Facebook, and also traveled frequently to Moscow. On June 30, 2016, he posted a photo of Trump Tower to Facebook and captioned it “I showed my Godson the HQ of our future leader.” And indeed, he did. And if he can manage to avoid any legal ramifications for allegedly attempting to meddle in America’s presidential election, he has actually, if accidentally, accomplished a very difficult task for any publicist: getting his client in the news.